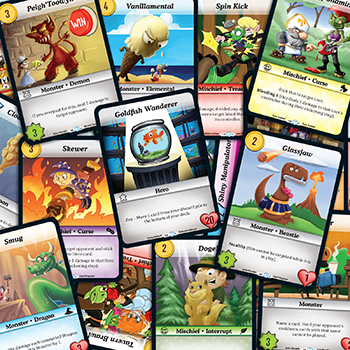 Daily Illuminator: Play The Munchkin Collectible Card Game & Triplanetary At PAX Unplugged! November 16, 2017: Play The Munchkin Collectible Card Game & Triplanetary At PAX Unplugged! We're bringing the Munchkin Collectible Card Game to PAX Unplugged, and we want you to join the party! We've got a few different events available, perfect for new players to get a feel for the game. On Friday, November 17, from 2-5 p.m., you can swing by our Munchkin CCG Learn To Play, where you'll use one of our six starter decks and play a full game against other fans! We'll be hosting a Munchkin CCG draft on Sunday, November 19, from 2-5 p.m. The draft is limited to eight players and will be single-elimination format. You'll be able to check out prototype cards and get an example of what you'll find in booster packs! To reserve a seat, go to Tabletop HQ the morning of the event and sign up. We expect these to fill up quickly, so make sure you lock down your spot first thing each morning! You can also find our schedule of other events at Tabletop HQ, so check out the list of games like Munchkin Shakespeare, Ogre, and Zombie Dice (with some amazing prizes, to boot)! If you miss our official events, swing by booth #932 and demo the Munchkin CCG there! We'll also have Triplanetary, our upcoming relaunch of the classic game of space combat! And don't forget to get your Pinny Arcade pins and other promo loot while you're there. If you aren't able to make it to PAX Unplugged, keep an eye on our Facebook , Twitter, and Instagram for show updates. Also, make sure to check out and back the Triplanetary Kickstarter when you return from PAX Unplugged; we'll be launching this classic game of interplanetary warfare on Monday, November 20! We look forward to seeing y'all there!